I realized in January that my mother was to have a special birthday this February. She was turning … ?5. I quickly got to work and organized a surprise party! For invitations I designed a very simple, clean postcard. 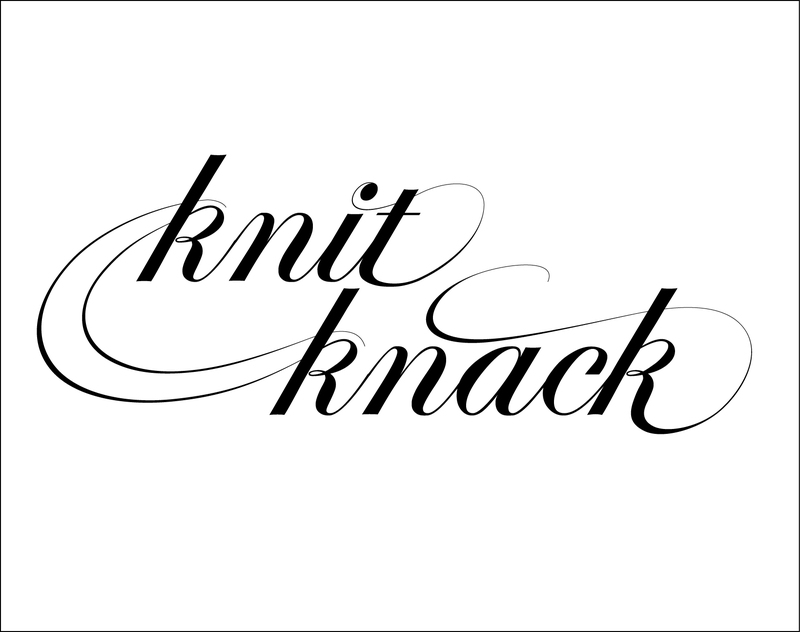 I love drawing type by hand – I think it added a warm, personal touch to the invitation. Being in Chicago, I wanted to find a local, independent printer that I could work with to achieve the best result for the postcard. The people at HD Design & Printing were fantastic to work with – I was able to make an appointment, talk to them about the result I wanted and look at papers. They were able to turn this small job out in a matter of days. Next task was to start planning the decorations. My go-to books at home are Paper + Craft by Minhee & Truman Cho and Handmade Weddings by Eunice Moyle, Sabrina Moyle, and Shana Faust (I find that at least 80% of this book translates to Handmade Events, not just weddings!). My apartment has a strong white base with a heavy dose of natural lighting – it’s the perfect neutral setting to easily transform. When choosing materials, I stuck with a palette of white and gold using subtle pops of pink and black. The cone wreath came from a project in Paper + Craft. 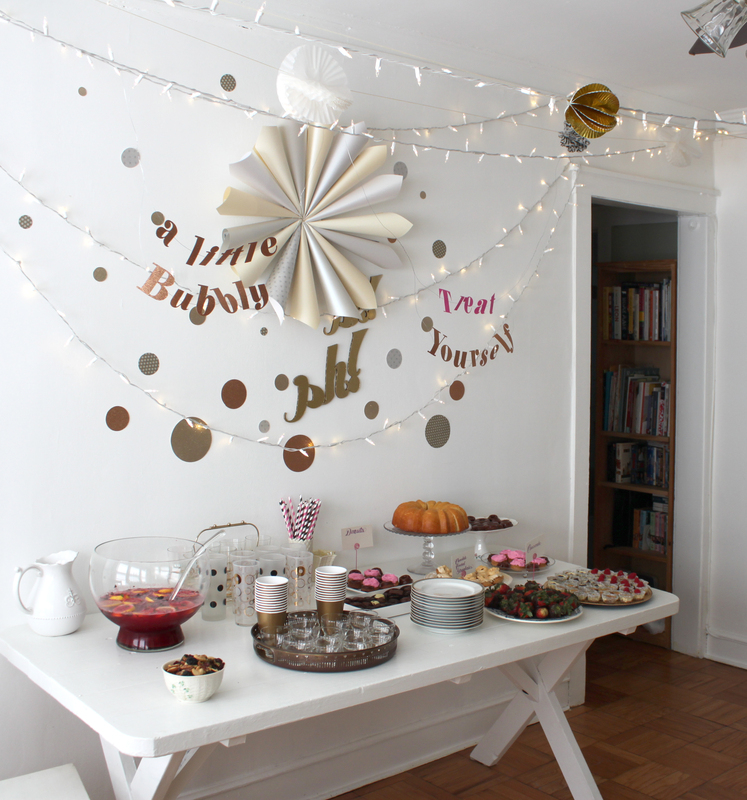 I chose a variety of neutral metallic papers to construct this decoration. In the dining room, I used two long strings of lights to run back and forth across the ceiling which created a party tent-like effect. From Handmade Weddings, I took inspiration from the Cupcake Liner Pom-Poms using both metallic gold and a black patterned liners. I also used coffee filters to create some contrast in size. 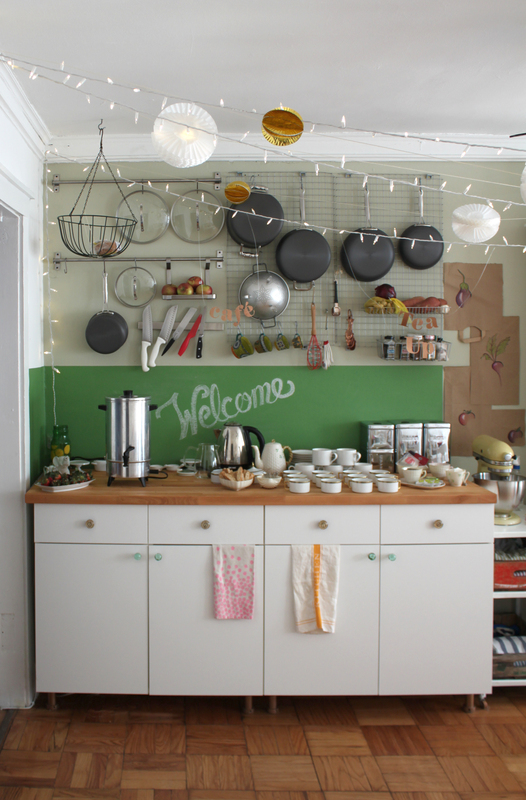 In the dining room, I had different stations which I denoted with floating signs. I created these by cutting letters out of glitter paper. I then used blue tape to secure the letters to metal wire I hung from the strings of lights. As for refreshments, I kept things classy and simple by serving coffee, a variety of teas, a blackberry lemonade champagne punch and an assortment of both savory and sweet finger foods – no forks! To serve food and drinks, I used a mismatched system based on the white and gold palette. The outcome was subtle, but still very fun and eclectic. What worked in perfectly was a set of china I inherited from my grandmother. I was both ecstatic and terrified to use this thin, fragile set of Bavarian china for the first time. While being acquired a number of generations back on my mother’s side, it has a delightful Art Deco feel to it – it’s simple with just a thin band of a geometric plant pattern on the edges, outlined in gold (of course). However, I figured that if I were ever going to use it – this was the right age group to give it a go! 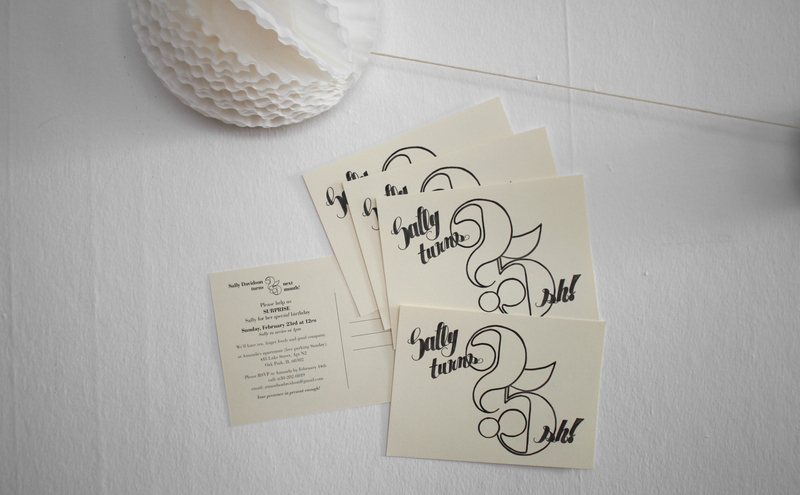 For a more original decoration, I went back to the original branding I had created for the invitation. I blew up the “?5” I had drawn and printed these 2′ elements as an engineering plot at Staples for about $4. I used a large piece of cardboard and cut these pieces out with a larger exacto knife. After these were cut, I carefully wrapped the pieces in crepe paper – carefully taping the strands in back and pulling the corners over the curves. I then took them outside and lightly spray painted them gold. I then took the “Sally turns” hand-drawn elements, blew them up, printed them out and cut them out of black glitter paper. I placed all these elements in a similar position to the invitation and it became a beautiful wall decoration. Last, but not least, I made the birthday girl a pin to wear. I used the Felt Bud project from Handmade Weddings. Instead of making boutonnieres, I glued the buds and leaves to a pin back.